Seems like the Alturas hasn't really set the charts on fire. The Fortuner is still at 1600+ units whereas Alturas is only at 321. I haven't compared the Endy here as the data isn't available. It is still a whole lot better than the Kodiaq which did only 143. I think this is just the initial hype for the new model. Sales will settle around 150-200 in 4-5 months especially since most potential customers (those wanting to upgrade from XUV5OO) are quite disappointed with the pricing. Thanks Aditya for the January monthly sales figures. 1. Although, the overall sales has seen a decline compared to last year January, the Top 3 has more or less increased or maintained their numbers. Honda has seen increased sales, however Tata has lost similar amount of sales which lead to Tata slipping to 5th place in the sales chart. 2. City is back with vengeance, after its 3rd position in the last calendar year, posting its best month since long time which was Sep 2017. However, the biggest surprise is that Ciaz has been pushed to the 3rd position by Verna. 3. Nexon has posted its best ever sales month by crossing the 5K for the first time since launch. While Ecosport has lost the 2nd position to Nexon for the past 6 months, it is able to sell a strong 4,510 units after long time. 4. The new Kicks has started decently, somehow similar to Captur (launched with 1,119 units), but hoping that it will sell more than what Captur has managed. However, the biggest surprise is Harrier launched with just 422 units. 5. The new Ertiga is maintaining a strong sales of more than 6K consistently, while Marazzo too holding up consistent numbers with Innova continuing its merry run. So, the MUV space is really expanding with the launch of Marazzo and new Ertiga. 6. Kwid is going no where, posting its lowest ever sales since its launch in 2015. And this is without another contender Eon, while the leader Alto seems to be going strong with more than 20K units in consecutive months, thus retaining the number one position in the overall sales chart. 7. The new Wagon-R has started with just above 10K units which is par as per its history, however the segment, which it is in, is on a roll now. The new Santro has been pushed to 4th position with both Tiago and Celerio beating it. 8. The Eeco has posted its best ever sales beating its best ever sales last month. On the other hand, Omni sales are dwindling, seems like MSIL is pushing Eeco in place of Omni to the customers. 9. Ignis has posted its 2nd lowest sales month since launch in Jan 2017, while Micra, Bolt and Brio, all have fallen to their lowest ever monthly numbers. 10. Amaze has regained some of its early sales during launch, while Tigor has managed to beat Xcent for the second consecutive month. 11. Hexa, Tucson and Tiguan have slumped to their lowest monthly sales and no Endeavor sold. Alturas G4 has managed to sell decent numbers even in its 3rd month beating Kodiaq and leaving CR-V in the last position. Wow Creta in its segment still sells lock stock and barrel, there does not seem to be a direct rival to this car yet! Forgive me for going off topic, can someone explain on what basis segmentation of cars are done, to my knowledge this is based on the size (length only). With that logic, how is City and EcoSport, WR-V in the same segment ( C2)? I know I am missing something here which I could not find with the right keyword search on the internet. I would like to see this as a permanent trend, somehow seems more befitting to the more deserving cars. Perhaps, 1st and 2nd positions being swapped every now and then between City and verna, with Ciaz a near 3rd. I guess the classification is more on the price-brackets the cars retail at. But I may be wrong too. 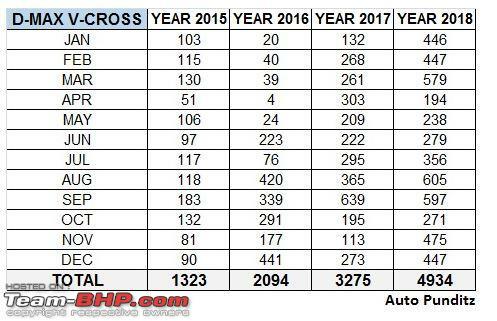 Jeep Compass seems to be stuck at around 1200 units; I would expect Jeep to take aggressive marketing campaigns to increase the sales from now on. There is the possibility that FCA is only allocating these number of units for our market considering that the Compass is also exported from the Ranjangaon plant. I booked a compass in January and it is yet to reach the dealership. For more than 2 weeks, the car was not even allotted and I had to change my preferred color to get one allotted. There are 16-17 such bookings after mine in the nearby dealership (RDC Royale) still pending FCA allotment. FYI, this is for the limited plus variant. Btw, the Hyundai dealership did not really try to hard to sell either the Creta or the Tucson. According to the sales advisor, in the case of the Creta, most prospects have already made up their mind and its only which variant is a discussion and for the Tucson, their sales target is only 1-2 each month. To me, it appeared as though the Tucson was overpriced to make the top end Creta look like a good deal which is actually helping Hyundai move 10k+ units of the Creta at a premium. SIAM numbers AREN'T Retail/Customer purchase.. but Wholesale/Factory Dispatches. Hyundai's premium offerings have always tanked, one reason that meets the eye could be that they get exceedingly greedy on their premium offerings, heck! they have been greedy on i20 & creta also; but since these two fell within middle class budgets Indians have been lapping these two up like they are a God send. Hyundai has to reign in its salivation when offering premium cars because buyers do not consider Hyundai worth putting so much money on! Last edited by gurthvader : 12th February 2019 at 18:39. Kwid is a good car, it's much better than Alto, it's the only car in that range to get 1 star safety rating and it looks much much better than anyone else in the segment. The updated version is getting ABS, reverse parking camera, smart phone connectivity so the sales will pick up slightly but they would not sustain unless and until Renault fixes it's service centers. Do not see the sales figure of ISUZU vehicles. Can we have it from next month. They have two brands D Max Vcross and MUX. 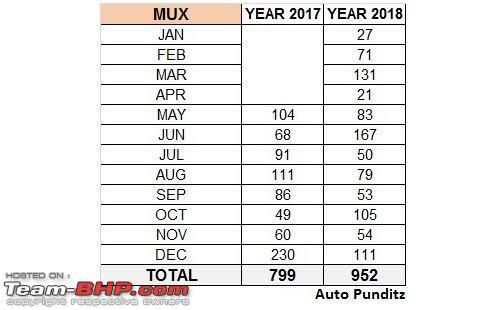 - 11,626 units of D-Max vehicles sold between Jan 2015 to Dec 2018. Last edited by volkman10 : 22nd February 2019 at 19:54.